1/2-day and 1 day Canoe Trips for the family. Idyllic, sublime, relaxing, there are no better words to describe a canoe trip along one of Britain’s majestic canals or rivers. 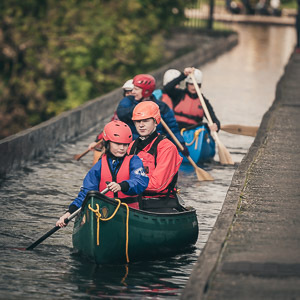 Open Canoeing is one of the oldest forms of travel: it can be an inspiring outing for the family traveling along historic and enchanting waterways steeped in the history of the industrial revolution. Llangollen Canal: Pontcycyllte Aqueduct: 1/2-day and 1 day. The llangollen canal is part of a World Heritage Site and is an official Area of Outstanding Natural Beauty; it is overlooked by mountains to both the North and the South West that are themselves Special Areas of Conservation. Canoeing along this canal is a pretty special experience but when you cross the stunning bridge in the sky, a 126 foot high aqueduct, then you know you are in for a stunning day out on the Llangollen Canal. Our trips start in Trevor – just at the side of the Sun pub where we can have coffee before we start. Our paddle then takes us along the canal, passing canal boats including the historic horse drawn canal boat, day trippers, walkers, cyclists and a variety of waterway wildlife to the Aqueduct or ‘bridge in the sky’. Here you will be offered breathtaking views of the famous and beautiful river Dee and beyond. Just over the bridge we stop for ice cream, tea or coffee before making our way back a short way across the aqueduct to the get out point. A fantastic, relaxing and inspiring day. Families, individuals, groups. No previous canoeing experience needed. Contact us to book your canoe trip now!